Mountbellew-Moylough are back into the county semi-finals after a narrow 1-13 to 1-12 victory over Maigh Cuilinn at Pearse Stadium after extra-time on Saturday. The black and amber men, who are under the guidance of Michael Donnellan and a management team of Kieran Murphy, Michael O’ Reilly and Noel Simmons, were slightly the better team, but an early red card for midfielder Matthew Barrett left them a man down for some 40 minutes of the tie. The winners of the replay between Milltown and Salthill will face last year’s finalists in the last four. Mountbellew were leading by 1-03 to 0-1 after 12 minutes, with Paul Donnellan hitting their major, and they looked in complete control. However, Moycullen rallied with points from a 45 from Peter Cooke, and other points for Pat Lydon and Eoin Walsh before Sean Kelly scored a goal to turn the tie on its head. Don Connellan’s team led by 1-05 to 1-04 at half-time and a shock looked a possibility, especially as they had an extra man for the second half. However, scores from John Daly, Colm Mannion, Barry McHugh with a super free, and Michael Daly, gave Mountbellew a three-point lead with three minutes left (1-11 to 1-08 ) of the second half and they should have closed out the game. However Moycullen rallied and Peter Cooke showed good leadership to hit three points in-a-row to bring the game to extra-time. Those 20 minutes only yielded three points, a free from Cooke, and points from John Daly and the winning score from Mountbellew forward Leo Donnellan. It was a poor quality game in many regards with a phenomenal amount of pulling, dragging and diving by players which meant referee Tommy Faherty struggled to keep a firm grip on proceedings. He also might have contemplated giving a late penalty – instead of a free to Moycullen – for a foul on substitute Evan Kenny that looked to be inside the square. That said, a few of the players on the field of play should consider giving up playing football to join the ranks of refereeing. They have so much advice to give to the officials when they might have been better to focus on doing the job they are out on the field to do. Moycullen have some nice players and they will feel that they could have sprung a shock. However Mountbellew looked more composed and they seemed to find scores easier to come by than the Connemara team. However, the winners will know that they have a lot to work on if they intend getting back to another final in a few weeks' time. They had some good performances from John Daly and Barry McHugh, at times. However a hamstring injury to key forward Eoin Finnerty is a significant blow unless they can get him back in the next two weeks which will be a tight schedule. Annaghdown will face All-Ireland champions Corofin in their semi-final after an impressive 2-15 to 2-9 victory over St James at Pearse Stadium. 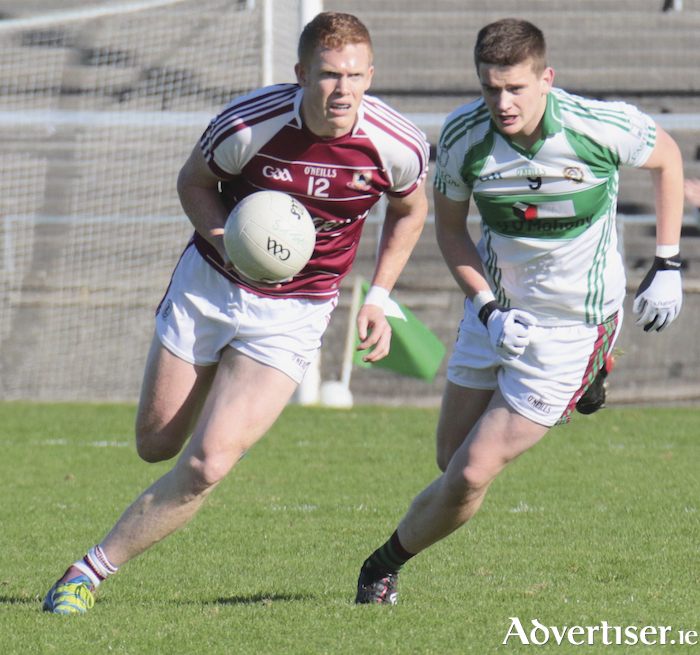 County captain Damien Comer hit four points, while his fellow Galway panellist Frankie Burke scored 1-5. The Annaghdown men led by 0-8 to 0-3 at half-time and they never really looked in any danger against a St James outfit that will be disappointed with its performance. Annaghdown were unlucky to lose to Corofin in last year’s semi-final, and they will be confident that if their big players, such as Anthony Pender, Eoghan Kerin, Niall and Matthias Coleman, Ciaran Duggan, Enda Mullarkey, Johnny Creaven, James Healy, and Burke and Comer show up the next day out, they can take Corofin down. That should be some game and there is colossal interest to see if the 2001 champions can halt Corofin’s attempt at winning what would be a phenomenal six-in-a-row. It is definitely a game not to be missed. The champions defeated Caherlistrane on Sunday in Tuam by 2-10 to 1-6 with Gary Sice hitting the two important goals to set up their semi-final clash. Salthill-Knocknacarra and Milltown must meet again when drawing after extra-time by 1-9 to 0-12. Amazingly Salthill-Knocknacarra did not score until the 44th minute with a strong wind a major factor and Milltown led by 0-3 to 0-0 at half-time. The city men were in big trouble in normal time and were on their way out of the championship until wing-forward Robert Butler hit a goal and added another point to send the game into extra-time where the sides could still not be separated. This winners of this weekend's replay will fancy their chances of reaching the county final as Mountbellew are missing a good few players from last season's side. It is all to play for at this juncture and there should be some exciting games over the coming few weekends.